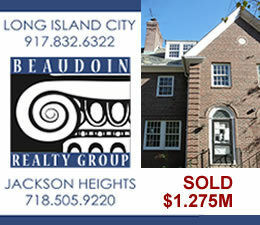 July 23, 2012 / Jackson Heights / Queens Culture / Queens Buzz. 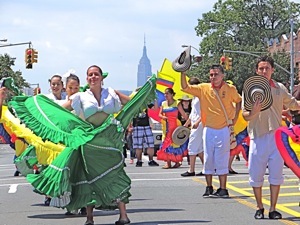 Queens celebrates Colombian independence. Sounds of cumbia, vallanto and salsa filled the air. Beautiful Colombian women and children dressed in traditional Spanish gowns performed dance steps to the music. The red fire engine of the FDNY sounded its siren, as the thousands of proud American Columbians responded enthusiastically to the siren calls. 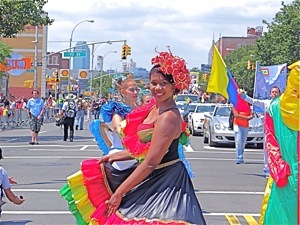 Yes, the 12th annual Columbian Independence Parade was off to a grand start in 2012. 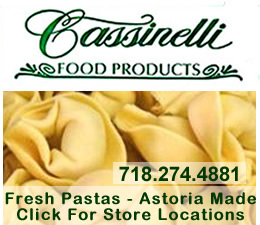 The parade was started in 2000 by a local Queens resident / businessman named Rafael Castelar. He got together a group to form the Colombian Independence Day Parade. 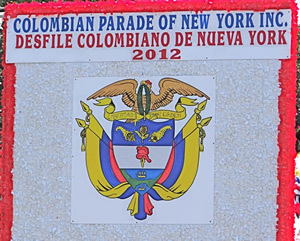 There had been a Queens based Colombian Independence Festival celebrating Colombia’s independence from Spain since 1984, but until 2000, there wasn’t a parade. The group formed by Rafael is called the Centro Cultural Colombiano [Center For Colombian Culture] and it’s located at 97-16 Northern Blvd in Jackson Heights. In addition to the Colombian Independence Parade, it hosts” 1) an annual banquet, 2) a reception for Colombian beauties [Colombia is one of the leading winning nations of Miss Universe Beauty Pageants] and other cultural events such as art exhibits and cultural performances. But I digress … let’s return to the parade. I arrived a bit after the head of the parade had departed up Northern Blvd, lead by a contingent of community leaders and government officials. We were told by one source that among the parade leaders were Rafael himself, along with NY Senator Peralta, U.S. Congressman Joseph Crowley, Yolanda Jimenez, NYC Commissioner to Combat Domestic Violence, and Julissa Ferreras, Jackson Heights / Corona City Councilwoman. Unfortunately, we never caught up to the head of the parade, as the floats, performances and the crowd itself, captured our attention until after the parade leaders had reached the end of the line at 90th Street. 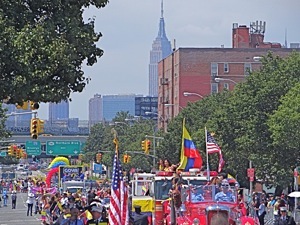 Our unofficial estimates of parade attendance is in the neighborhood of about 10,000 – making it one of the most popular parades in Queens in 2012. To date this year, the only other parade to approach this level of attendance was the Chinese New Year Parade. 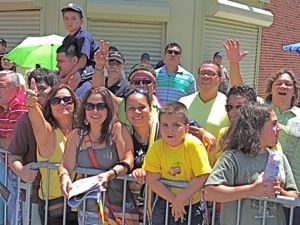 Other news sources reported parade attendance of between 50,000 to 75,000 attendees, but we believe these estimates were never verified by them and are closer to counts for the total population of Colombians in Queens. 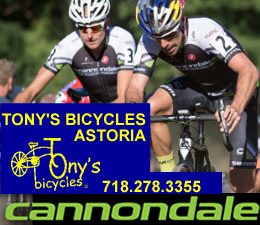 As a point of fact there are about 15,000 to 20,000 Colombians living in the Jackson Heights / Corona and surrounding neighborhoods of Queens. 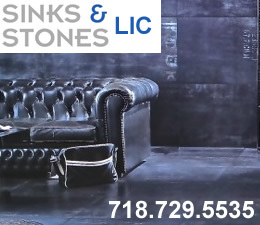 There are about 75,000 to 80,000 Columbians living in Queens, and about 100,000 Colombians living in NYC in total. 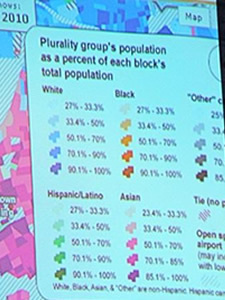 These numbers are per the U.S. census. On July 20, 1810 Colombia declared its independence from Spain. The fighting with Spain would continue for another nine years, and the last battle with Spain was fought on August 4, 1819. Nonetheless Colombians celebrate the date of the declaration of independence, just as we do in America. The United States of America approved the Declaration of Independence on July 4, 1776; and it wasn’t until seven years later with the signing of the Treaty with Great Britain in September 3, 1783 that the war for independence ended. But I digress again … let us return to the Colombian Parade of 2012. 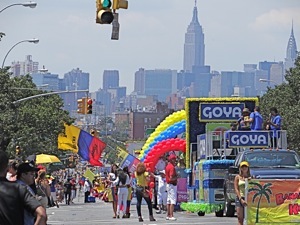 A couple of the floats were sponsored by large companies, including Goya – a large Latin / Spanish foods company and Avianca – the largest airline in Colombia and one of the largest in Latin America. Several national American brands also sponsored floats including Coca Cola and Time Warner. And there were some local floats including one sponsored by a local restaurant, Boulevard, and a local Colombian folklore dance company. This is by no means intended to be a complete list, just a smattering of some of the international, national and local sponsorship interest. One of the first floats carried a Colombian beauty and a couple of youngsters. There were several convertible cars carrying additional beauties, homecoming-style, sitting atop the back cushions of the back seat. There were music and dance performances by several talented groups of both men and women dressed in Colombian folk costumes. There was a contingent of motorcyclists on well-kept and freshly washed bikes. There was a fire engine filled with passengers, and accompanied by a group of FDNY firemen. There was a horse drawn carriage as well as marchers dressed in clown costumes and other get ups. And there was a greatly enthusiastic crowd of well wishers who made all the work put into the parade by those marching and those who organized it well worth it. The crowd consisted of everyone – from the very young ninos, to the very old abuelos. They came as singles and they came with their families and they came with their friends. 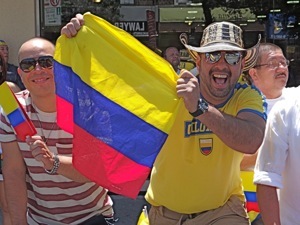 And they relaxed in the warm air on a sunny day, waving their flags, cheering their friends and families, applauding the performers and smiling easily for those who marched in the Colombian Independence Parade in the warm summer air on a beautiful day in our beloved borough of Queens New York. Salud. 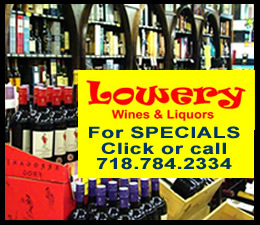 Special thanks to Adolfo del Valle of the Centro Cultural Colombia of Jackson Heights for providing some of the information contained herein. 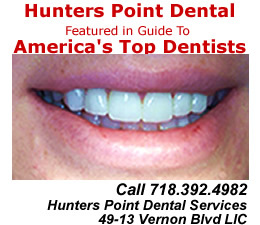 Click here to view photos of the Colombian Parade 2012 in Jackson Heights Queens, or you can view the photos below at your own pace by clicking on the arrows.